General Expertise:Windows7, Microsoft Office Word, power point, Graph Pad, Endnote, lab chartOrgan bath. -I’m interested in performing studies related to different receptor activities using blockers via organ bath technique inblood pressure and thyroid gland diseases making models of them on rats. -Hormonal diseases and their factors. Thesis title: elevation of Endothelin-1levels in Hyperthyroid Patients and Its Receptor Activity in Induced-Hyperthyroid Isolated Rat Aorta. 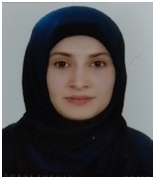 I was born in 3 December 1990 in Soran-Erbil, I has bachelor degree in Biology,college of scienceSalahaddin University in 2012 and as a first one of the University directly employed at the university.I was worked as an assistant biology for two years in immunology, sewage microbiology and botany subjects.Now I has MSc.at Cell physiology,from biology,Salahaddin university-Erbil 2014-2017and work as an assistant lecturer at the Soran University, Faculty of Science, Biologydepartment.